Apart from the physical act of cutting and gluing, digital scrapbooking is a lot like the regular version. You take photos, backgrounds (the “paper”), and embellishments, and put them together to make a page. It’s just all done on the computer. It’s a great way to use all those pictures you have stored on your hard drive from your digital camera. I use a combination of Adobe programs (Indesign, Photoshop, Illustrator and Acrobat) to create my pages, but probably the most widely-accepted and user-friendly software for digital scrapbooking is Adobe Photoshop Elements, a popular photo-editing program. There are several websites out there that provide tutorials for getting started. These websites may also sell digital “kits,” grouping themed papers and embellishments ready-to-use. Some even offer free downloads for personal use, which is great. Sometimes, I use my scanner to save digital versions of store-bought papers, wrapping paper scraps, ribbons, lettering, even tissue box patterns, for future use. 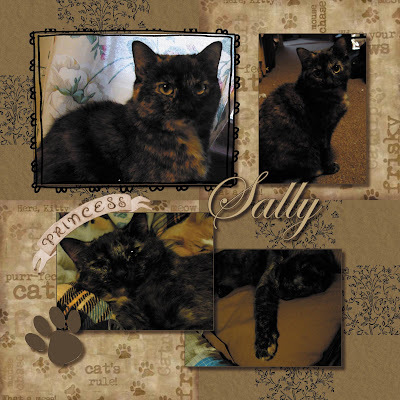 This is one of the pages that I’ve created, featuring my adorable cat Sally. Sometime, I would like to create my own digital kits to share and to use in my pages.